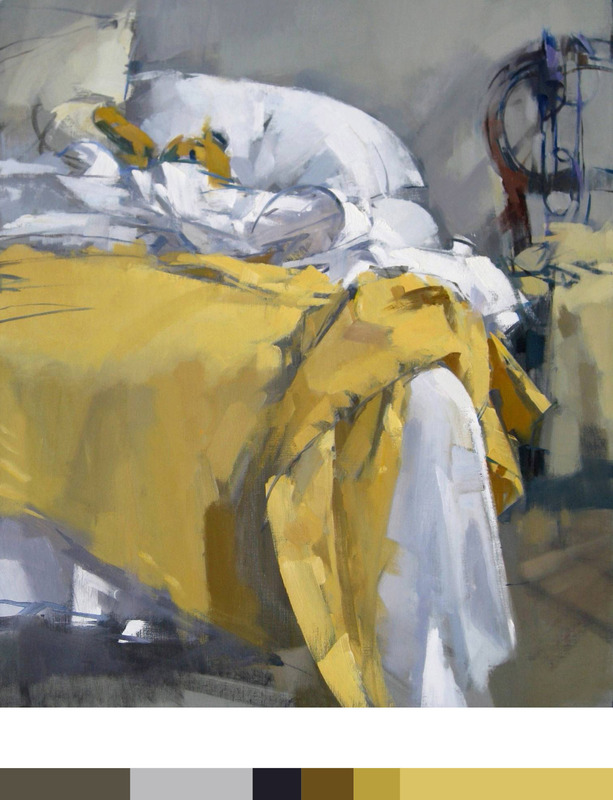 In light of yesterday’s post (the one where I spilled my deep secret about my horridly disheveled and incomplete bedroom…) I was pretty shocked when I stumbled upon this painting by Maggie Siner a few hours later. Crazy. Guys, this painting looks just like my bedroom! I mean, it’s a little weird. Same colors, same textured golden bedspread (West Elm duvet cover), same lush linens on the bed; but our headboard, (still in the process of becoming beautiful,) is sitting off to the side (similar to the chair on the side of this painting). Thank you Ms. Siner for helping me enjoy my bedroom until it’s complete! Although, I can’t wait to get this room together so I can, a) sleep in a real assembled bed, and b). show off my stylin’ space to all of you! The painting above, Yellow Blanket, was created by Maggie Siner and (besides the fact that she basically stepped into my house to create this painting) the lush brush strokes and beautiful color combinations really drew me in. Just look at the masterful strokes and shapes! Maggie has a fantastic way of leaving so much of the painting to the imagination while also using well defined, high contrast lines. …and of course, I’m in love with the color pallet. Paintings are wonderful. Thanks for posting. I love these paintings. The colors and the fun emotions. I want to learn so much from her! What you mentioned about leaving some of the painting to the imagination is what I am looking forward to learn, what to include, what to leave! Love it! Thanks for sharing this!